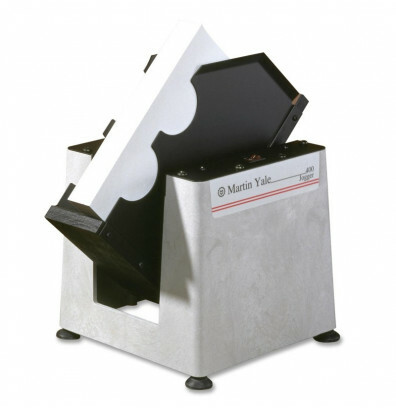 The Martin Yale 400 Jog-O-Matic tabletop paper jogger aligns and organizes a ream of 8-1/2" x 11" or half a ream of 8-1/2" x 14" at a time. Ideal for print shops and copy centers and a great companion for high speed copiers, folding machines, printing presses, cutters and perforators. Martin Yale 400 Jog-O-Matic tabletop paper jogger is used to align and organize documents so they can be fed into other machines for binding, hole punches, cutting, mailing, shipping, printing, and more. The Jog-O-Matic also helps eliminate static electricity and paper sticking for easier processing. Simply stack your paper into the enclosed bin, flip a switch, and the jogging process begins. The end result is static-free, straight and aligned paper. The Martin Yale 400 is ideal for print shops and copy centers and a great companion for high speed copiers, folding machines, printing presses, cutters and perforators. It is compact and lightweight, so it can be moved around without any hassle. Paper jogger easily fits on a desk or table, but be sure that where it's placed is sturdy, as the vibrations will cause the machine to shake. Rubber feet help the machine remain in place while in use. The jogger we had quit working and we were looking for a new jogger in the mail room. 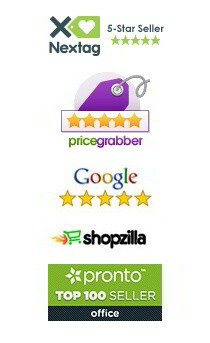 I looked several places and got several quotes but digital buyer had the best price for the same product. We received the jogger in a few days and it was better than expected. Very quite.